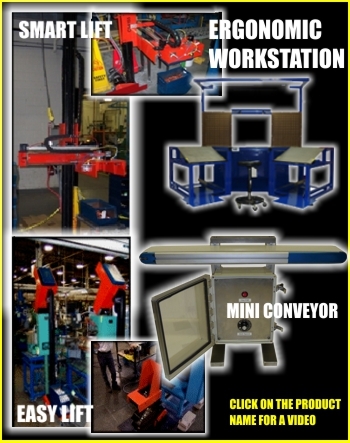 Our Ergonomic Systems Team helps plant managers streamline material handling constraints in an ergonomic fashion. Specializing in the utilization of off the self components to keep costs down and to ease maintenance, we have rapidly gained a reputation for common sense, affordable solutions. Leveraging our significant experience working with all types of manufacturers, we have plenty of hands on experience in the day to day operations of manufacturing facilities. From small companies nested in rural America to large, Fortune 500 companies with a global reach, we can handle the job. Since we are based in the center of the United States of America, our personnel can quickly reach most any job site in the US and abroad. Shipping of components and repairs (should that unlikely event ever happen) are accomplished in an efficient and timely manner. Our primary manufacturing facility is a model of efficiency and space utilization, and, since it shares its location with our R& D team, we can minimize the time it takes from concept to proto-type. Further, by networking with major corporations in the region, we are able to quickly bring a new product line to the market and place it into service with a minimum of wasted effort.